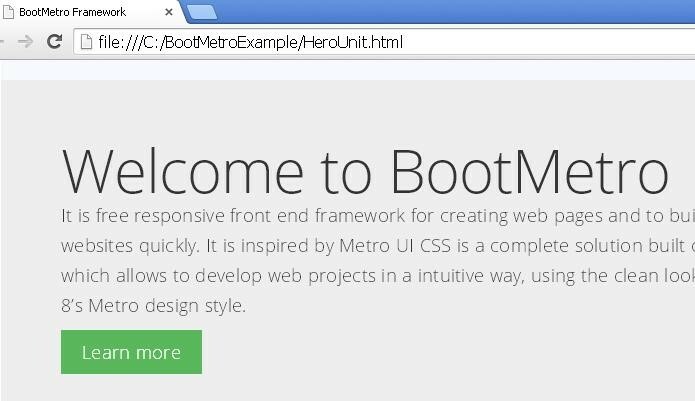 This article introduces you to the BootMetro web framework. Since the history and initial concepts, until the main features, components and typography, well explore it at all. The first line of the source code was added to BootMetro framework in May, 2012. The framework is still changing by using innovative and exciting ideas for developing websites using Metro UI style design. The many new projects begin with existing or older project’s source code and you could be able to tell a rapid rise in the project’s source code early in the project’s history. The source code for BootMetro has not been changed over a year. But still the code is useful for whoever is making use of this framework. There are four people who have contributed over the entire history of the BootMetro framework: Ray H.J Kwon, Aozora, David Smith and Momo. BootMetro is one of the most successful web design languages for creating web or mobile apps. The BootMetro allows creating web applications with look and feel of the Windows 8 Metro UI style. It uses the Metro UI CSS which provides base for UI style. It is built on top of Bootstrap by including its additional features like tiled pages, application bar etc. It gives more focus on content and provides simple ways to navigate to your other pages. It provides different types of font icons with any color and any dimension and shows messages, warnings and errors like Windows 8 do. It uses Bootstrap and HTML5 Boilerplate to integrate the framework. The HTML5 Boilerplate is a template which can easily build websites and brings together set of best practices for front end development. Figure 1. Bootmetro download page. It provides different types pages for doing Metro stuff and can be reused whenever you need them. The above code describes how to display columns using BootMetro framework. It includes all the CSS files which are placed inside the assets -> css folder. The body contains a container that displays a row class that must be placed within a container for proper alignment and padding. The row class is used to create horizontal group of columns. Grid columns are created by specifying number of twelve columns you wish to span. In this code, we have used “span" class which would create three equal columns. The js files are placed before the body tag ends to load the program quickly. When you run the code, you would get below in Figure 2. The framework supports different types of media queries which display your application appropriately on different devices such as desktops, mobiles, tablets etc. The Table 1 provides details of different devices. Table 1. Different device details. It’s possible to display different types of headings with use of h1 to h6 tags as shown in Listing 2. Run the above code and you would get the output as in Figure 3. The above program displays a table with different types. The table-condensed class makes the table more compact, the table-cell-hover class defines hover state on each cell, the table-bordered class displays the table with borders and the table-striped class defines the table with zebra striping to table rows. BootMetro contains standard components such as command buttons, navigations, dropdowns, progress bars, alerts, badges, breadcrumbs etc. Some of these components are common, if you know Bootstrap technology. The functionality of all these components works the same as in Bootstrap. The new components apart from these components are, command buttons, Metro nav list under navs components and, indeterminate and indeterminate ring styles under progress bars components. These special action buttons can be used with .win-command class along with button and anchor elements. If you want to make use of icons in BootMetro, use win-commandicon and icon-* class. To specify a label for an icon, use win-label class within the span tag. The screen shot of the above code will be look like as shown in Figure 5. BootMetro also provides a class called .win-commandimage to use custom image of user choice. The code uses .win-command class to use command styles as discussed in the previous example. The .win-commandimage class displays the custom image by using tag within its class. It is also possible to customize the command buttons by adding CSS styles to the buttons. 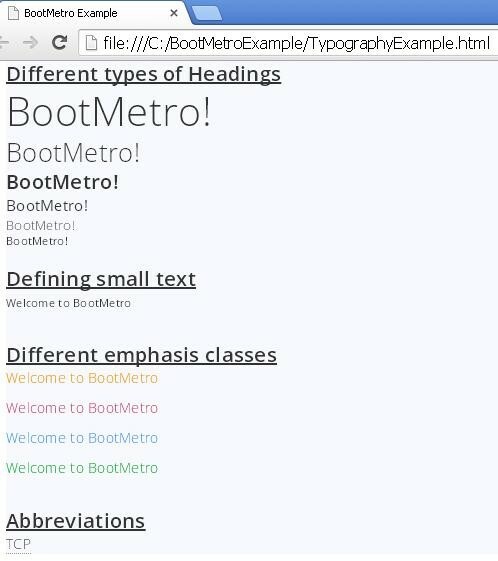 This is one of the new navigation components in BootMetro for displaying metro styled groups with optional headers. This can be achieved by using the class .nav metro-nav-list. The code uses .nav metro-nav-list class for displaying the metro styled groups of nav links. The .nav-header class defines header for the particular navigation. If you want to define nesting of nav list within metro nav list, use the class .nav. The BootMetro provides different types of page components such as page header, page header with title, back button and navigation menu. We will create one example by using these page components. The code displays the back button with title name. The back button is displayed using the class .win-backbutton which is defined within the anchor tag. The title name displayed with color by using the class .header-dropdown accent-color. It is like a jumbotron style component to display extra information on your site. It is mostly used for calling extra attention to content on marketing and heavy sites. It can be used by adding the class .hero-unit. 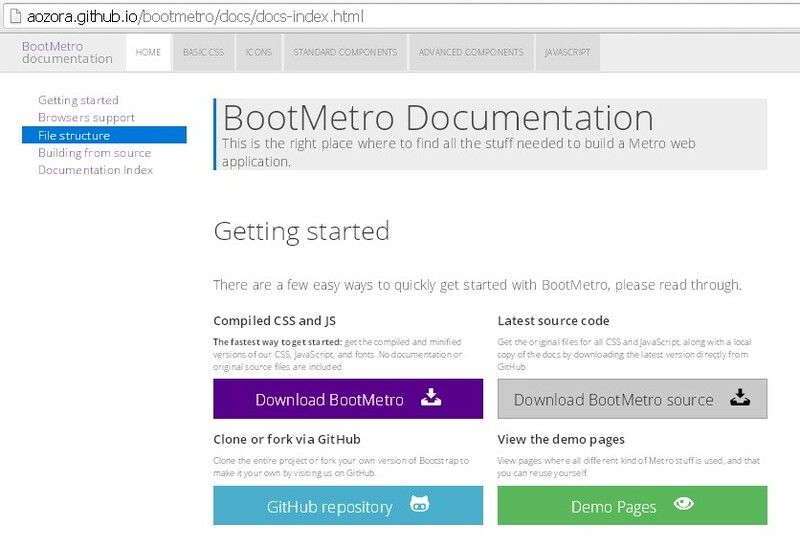 BootMetro is a simple and flexible framework for creating web applications. It is supported by all the browsers. It is built on top of Bootstrap and HTML5 Boilerplate. Uses Metro UI CSS as base for UI style. Provides simple ways to navigate to other web pages. 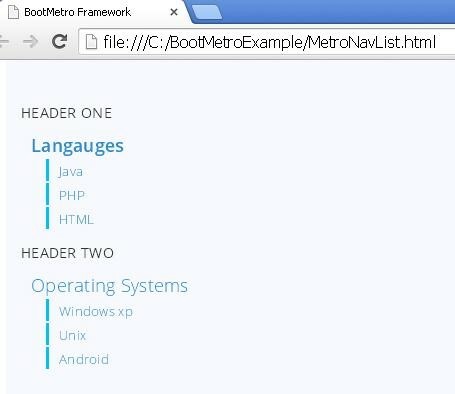 Here we saw some of the important concepts of the BootMetro framework. This framework as you must have known by now id heavily based on Bootstrap framework. Knowing Bootstrap well would be an advantage to start with BootMetro. The source code of all the above examples is attached with this tutorial. You can execute and play around to understand BootMetro framework better.